"Finding missing aircraft can be an expensive process based on unreliable facts," said Aeronautics Administrator Mike Pape. "It can also take valuable time when time is at a premium and survival hangs in the balance. Our staff began investigating ways to obtain more accurate data to reduce search time." The results proved promising. The receivers are relatively inexpensive, but require an internet connection. The signals transmitted by aircraft with ADS-B transponders leave a bread-crumb trail via the internet. This is currently beyond the capability of air-traffic control in remote areas like backcountry airports, where the mountains are a barrier to standard radar reception. Tim Henderson of Aeronautics said, "The GPS in the aircraft sends the aircraft location to the transponder, which broadcasts it to the world. The FAA receives the location, the altitude, and other data and uses it for aircraft separation and traffic control. It is the Next Generation of RADAR." Since it is a broadcast which reaches hundreds of miles, we are taking advantage and receiving the signals to track an aircraft for search purposes.
. "The receiving units increase the possibility for survival to our flying public, and reduce the time needed in our Search-and-Rescue efforts to find missing aircraft," explained Pape. "The sooner we find an aircraft in distress, the higher the chances for survival of its occupants. We take that responsibility very seriously." The ADS-B receivers provide the additional data to perform the task. 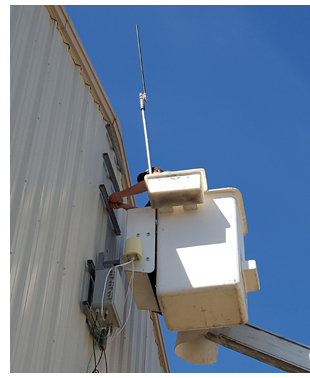 Pictured right: Antenna installation at the Riddle maintenance shed.